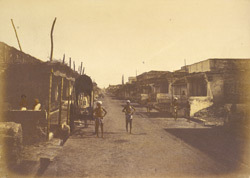 Photograph of Black Town in Madras, taken by Frederick Fiebig in c.1851. Madras was founded in 1639 by the British East India Company and was the first important English settlement in India. Black Town was originally the old native quarter and grew up outside the walls of Fort St George to the north on the seafront. In the 18th century, Europeans moved out of the fort and into Black Town. This is a view of a street with colonial buildings in the European section. As Madras grew, Black Town became the commercial centre of the city and developed a very high population density. Its grid pattern layout is the earliest example of English town planning on a large scale in India. Three broad streets intersected the town, with narrow, irregular streets running in between. Its name was officially changed to george Town after a visit by the Prince of Wales in 1906. Little seems to be known about Frederick Fiebig. He was probably born in Germany and became a lithographer (and possibly was also a piano teacher) in Calcutta, publishing a number of prints in the 1840s. In the late 1840s Fiebig turned to photography using the calotype process, producing prints that were often hand-coloured. His photographs includes several hundred views of Calcutta in the early 1850s, one of the earliest detailed studies of a city, a large hand coloured collection of which were bought by the East India Company in 1856, their first major acquisition of photographs. Among the roughly 500 pictures were views of Calcutta, Madras, Sri Lanka, Mauritius and Cape Town.